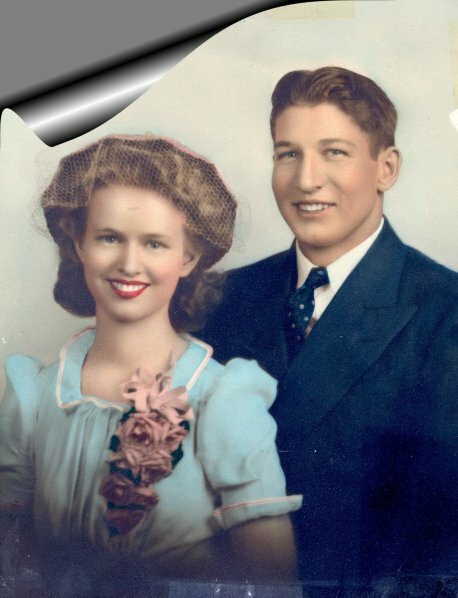 My parents, Dorothy and Walt Ferguson were married in Pine Bluffs Wyoming, July 14, 1943. The only witnesses to this civil ceremony were his dad, Walter Ferguson, Sr., her mom, Mary Salsbury, and her Aunt Eva Hoffer. The Judge seemed a bit nervous, or unaccustomed to performing such ceremonies. After the ceremony, the small group went to the lone cafe in Pine Bluffs for a meal before heading home. There was no honeymoon. As soon as they arrived back at the ranch Walt changed his clothes and headed for the hayfield. Dorothy was left in her new home, all alone for the rest of the day. She had been living with the normal conveniences of the 1940s in Cheyenne, and had been brought to an old log cabin with no electricity, running water or any of the appliances she was used to. She had to haul water, stoke and keep a fire burning in her coal cook stove, and even had to heat water for baths and laundry. I was born at De Paul hospital in Cheyenne. I remember life starting at the "Haygood Place", my home for the first 13 years of my life. My dad, grandfather and uncle had purchased this property, and my mom and dad had moved to this little piece of heaven before my brother Tom and I were born. I am sure that the newer, more modern house with running water and electricity and a gas heating stove had to seem like a dream come true to my mom. We had a well with the coldest best tasting water this side of heaven! She had a cute little "U" shaped kitchen, two very small upstairs bedrooms,and a bathroom. Downstairs were two very rough unfinished bedrooms and an open area where we played. There was a hole in the cement where there was a crawl space for part of the house. The crawl space always smelled like nasty spiders and dust. There was also a nice storage room where we stored canned goods, toys, and my sister Kathie's gorgeous dance costumes. And our nice upright freezer was also in this room. When I was still very young, Dad fixed one of the bedrooms for Kathie and me. He made us a bunk bed and dresser, two benches, and some build in chests of drawers and shelves as well as a nice closet. Mom and Dad painted everything pink and powder blue, and did some pretty stenciling on the furniture. But I think there was no carpet on the floor, and it seemed to always be too cold for me down there. Back upstairs, there was a front porch that was actually at the rear of the house as you entered the property, so it was only used on one occasion that I remember for a front entrance. I think this was my favorite room in the house. I remember my mom's player piano and my dad's desk/safe in this room, and I loved sitting out in the porch banging on the piano or soaking up the sun while looking out on the beautiful hills that surrounded the yard. My mom would play the piano and I would sit and listen to her. Or my dad would work on the registration papers for our Registered Angus herd, and I would watch him do his work. For some reason I do not really remember doing much with my two older brothers during those years at the Haygood Place, I remember doing stuff with them mainly when we were working cattle, or going to church or working with the 4-H and FFA livestock. But since I shared a room with my sister Kathie, and because Tom was close to my age, I remember doing a lot with them.Mainly cleaning house with Kathie, and either playing trucks, building roads or hiking with Tom. Bus and Chuck must have been either out working with Dad or in school most of the time. The older kids roomed with my grandparents and then my Aunt Polly and Uncle Lee while in high school. At that time there was no bus running from District 4 to Cheyenne where we all attended high school. So I only saw them on the weekends during the school year. I have very fond memories of doing things with both my mom and my dad. The most vivid and special memory I have with my mom is related to the Christmas Season. When I was about 3 years old, my mom told me the story of Christ Jesus while we were setting up the Nativity set. She always called it the "Crib Set". She told me about how Jesus was born of the virgin Mary, and that he was God's only Son. Then she told me all about how he lived on the earth, and that when he was a grown man, He was killed on the cross, because of all the bad things we do. Then she told me He died, but He came back to life and now lives in Heaven. She explained that that is what we would celebrate at Easter. This really hit home with me, and I wanted to thank Him and then live for Him. I asked Him to forgive me for all the bad things I did. So that Nativity or "Crib" set has always been very special to me, probably the most special thing in my parent's home. Every year as we would set it up, I would revisit that time when I was so very young, and my mom shared Christ with me. I am eternally thankful for her sharing with me on that Christmas in 1956. Many people say a small child cannot understand and be saved, but I did and was at that time. I know and I remember. She baked cakes and pies, and raisin bars, and many other yummy deserts. She made fabulous meals, casseroles that were out of this world. And I remember helping her cut up the chickens and flouring and frying them for our Fourth of July Celebrations. We used to go down to my Aunt Inez's in Ft. Collins for the 4th, and my mom would cook up a storm for the celebration. When I was very young, we used to have the old time round-ups and brandings, and once again my mom outdid herself in preparing fantastic food for the day. She had a huge Wearever pot, and she cooked roast beef dinner in it. She made vegetables, salads and pies and cakes. And then we would cover it all with foil, and cook coffee in a huge granite coffee pot, and stick a wad of foil in the spout. Then we would pack everything in the 55 Chevy wagon and head up to the corrals and unload the stuff into the cabin. Usually the night before we had gone up to the cabin and cleaned it out. That was a fun job. It was pretty easy since there was little furniture, and only two room. But it was a traditional thing to do every year. We took lots of hot water in big 5 gallon jugs, lots of bleach and soap, and Windex for the windows. We also took a bar of soap,a couple hand towels and wash cloths and rolls of toilet paper for the out house. We would get water for the day at the nearby spring. We took plenty of food for the crowd! I only "helped" her get the meal ready until I was about 7 years old. From then on I joined the crew rounding up. Another thing I remember doing with both my parents was going to the Granite Canon Post Office to pick up the mail. Sometimes I was allowed to get pop out of the pop machine. That was always a treat. Bill Mathews was the Postmaster. He always seemed like a rather grumpy guy to me. I have no idea if he was or not. My mom drove the school bus when our district consolidated, and we started attending the Willadsen School. We had to get on the bus early in the morning, and we were the last ones off since our mom drove the bus. But at least we were with our mom the whole time. I read books the whole trip, so it never seemed long at all. My parents were the janitors also. I remember running the polisher at the school, and once a week we spent the whole night cleaning the school. I remember falling asleep in the hallway waiting for the job to be done. My mom was also on the election board, and every election, she would be at the school all day long. That was a pretty special day. She once again would cook a wonderful lunch and dinner for the election crew. We got to eat lunch with them since the polling took place at our school. Then we would get to eat dinner there too because they were never done counting before dinner time. My Dad always drove the school bus on election day, and would go home do the chores, and return to have dinner at the school. Mom used to watch TV and iron in the living room most mornings. I had her help me make doll clothes for my dolls, and I remember starching and ironing those doll clothes after sewing them on her black Singer sewing machine. One of the pieces of clothing I particularly remember making with some orange and brown semi checkered fabric. I have no idea why that "dress" is stuck in my mind. Mom would clean on Saturday mornings, and KAthie and I would help her. I had to clean the bathroom and my bedroom and the kitchen when Kathie was not around. I hated cleaning my half of our bedroom, but enjoyed cleaning the kitchen and bathroom. I was really blessed to have a Christian mom who spent good quality time with me and taught me so many things about life, but most importantly, she helped me to become a follower of Christ, and no greater gift could she ever give to me. She washed and cleaned and always had a perfect meal on the table for my dad when he got home. I remember our meals always included a vegetable, a starch, a salad, and a meat. She always made a desert. She always made sure the plate looked good, with plenty of color on it. She was truly the "June Cleaver" type of wife and mother. She was devoted to my dad, and taught me how to treat a husband with love and respect. "June Cleaver" types really did exist back in those days. Both my parents were leaders in the Happy Jack 4-H Club. 4- H was a big part of our lives .I remember our 4-H club doing the Cotton Candy booth at our annual county Mardi Gras. One year Mom and Mrs Pretty had us all wear pink shifts and the guys pale green shirts and pink cotton shaped like cotton candy on our heads. I was young enough that it was fine for me, but the rest of the kids hated it! They just did not get the "costume idea". Our parents hosted an annual hay ride for our 4-H club as well. That was always fun, but in retrospect, it must have taken a lot of work on both parent's part. Mom with getting all the foods prepared, and Dad with getting the hayride set up and the fire at the drop off area ready. It was always a really fun night for all of us. The other thing I remember was the Old Timers Annual Picnic and dance. It was held on our property, and the entire community would show up. We picnicked all day, and then we would go home to do chores and change into dresses for the dance, and come back and dance the night away with an old time country band. The building was made out of dynamite boxes. It was really cool! I would go with my dad in the winter to feed cattle. He used a sled and team of horses to feed when the snow was on the ground. The team of horses were Jack and Jill. They were Percherons. I loved them! We would load the sled with hay, and then when we got to the herd of cattle, I got to "drive the team" while dad would pitch hay off to the cattle. When we were feeding cake to the cattle, I was allowed to do this chore while he drove the team. I remember one time when one of the more gentle registered cows actually climbed on the sled with me to get her cake! It frightened me to death, and I screamed and ran to the safety of my daddy! He had to get her off the sled... Feeding cattle on a cold winter's day is one of my fondest memories. I loved the time I was privileged to spend with my dad. We also used to work cattle a lot of the time once I was older. I really did not get to see much of her until the fall of the year. Most of my childhood was spent on the bare back of that pony. We grew inseparable. She spent most of her life in our barnyard. One of my favorite memories is a collective memory of working cattle in the hills of Wyoming. I loved trailing cattle, and working them in the corrals. I loved riding my Dottie and spending the day riding. I think it had to be the most fun ever. I loved working with my 4-H cattle, and halter breaking them. Dad was always making me pick the calves I would show at the fair, and I remember seeing a calf I would think was show quality, and then having to tell Dad why I thought it was one I should take to the fair. He would listen to me, and if I was totally wrong about a calf, he would explain to me why my choice was a bad one. But usually he liked the ones I picked. I was always happy because only one time my own cows' calves weren't two of the many I would pick to show. It was so neat to know your cows had two of the best calves on the ranch. When I think about it now, my Dad was pretty nice to let me take all those calves to the county fair every year. I would haul in a whole trailer load of calves, and cow calf pairs, and fat steers and show heifers and bulls. But then he used to say it was nice of me to gentle down a couple head to make working them easier. disposition. We had very few mean cows on the ranch. Dad was always doing something with leather on the days when he could not go outside. I remember him repairing saddles, bridles, and any other assorted pieces of tack or equipment, sitting in his little office, or at the kitchen table. He had an old black chair he had acquired when the schools were consolidated, and he would sit at the kitchen table in his chair and work and drink coffee, and write "I love Dot" in pencil on the table. Dad was pretty active, considering how much of his time and efforts was spent on his ranch, in community affairs. He would never want to go to any community gatherings, but once there, it was hard to get him to leave, because he always knew everyone and spent hours talking. Dad was the president of the school board, he was president of the Wyoming Angus Association and the SE Wyoming Angus Association, a 4-H leader, and honorary FFA adviser. He was an elder at the Meadowbrook Baptist church, and also served as an usher when he belonged to the Presbyterian Church. I remember one year he and my mom taught my VBS class at the Presbyterian >Church. They held it at night that year, so he was able to help Mom. A lot of what I learned from him, helped me to instill some of this into my own children, who were actually fortunate enough to actually learn most of it from the master himself, with just a little help from me. My dad was a big softy. He would cry at the Hallmark ads, He loved his wife, children grandchildren, and the ranch. He worked on the ranch right up to his last day on earth. He loved the Lord, and though not a great scholar, he instilled the basics and shared the Love of Christ. He was an amazing man.~ The last of the Old Time Cowboys.